Oh boy you are gonna love this! Martha's new Cupcake book came out Tuesday and you can bet I was at Barnes & Noble bright and early and got my copy. Oh my gosh I want to make every cupcake in the book! They are gorgeous. First of all, you need to know that I am a complete fool for cupcakes. Those sweet little tiny cakes that are all your very own! You don't have to apologize to anyone for eating the entire cake. You can run your finger through the icing and not a soul can speak sharply to you (you all know who I'm talking about here:-) 'cause it is yours! You can break it in two and put the bottom half on the top half so the icing is in the middle and you have like a cupcake sandwich. Oh the possibilities of cupcakes are endless!!! I could not wait to dig in to this wonderful cookbook! I perused the book, looking at each photograph longingly and lovingly. Problem was I couldn't decide on which one to start with. There is a wonderful blog that I follow, http://www.tasteandtellblog.com/ . Deborah does a cookbook of the month recipe each Friday on her blog. So I decided I would blog along with her this month because she has chosen "Martha's Stewart's Cupcakes"! How fun is that, I ask you? So here we go!!! After much deliberation, and reminding myself that I have plenty of time to bake all these cupcakes if I want to, I chose the "Ginger Molasses" cupcakes. Molasses cookies are a favorite in this house. (And we all know I live with the original Cookie Monster and he knows his cookies.) So I figured these would be a hit. And boy was I right! Holy Cupcake, Batman!!! These things rock!!! They are a little labor intensive, but I think most of Martha's recipes tend to be. But most of her recipes are well worth the extra effort it takes to make them. And these cupcakes were no exception. I am hooked. 007 is hooked. The glitches, if you can call them that, were just a few. Peeling and chopping 9 ounces of ginger was the most time consuming. I could have used my food processor but I've never done ginger in it before and didn't know how that would work. Another thing was that when I baked the cupcakes they took about 6 minutes longer to cook than the recipe stated. And as they cooled they sunk in the middle. The recipe does state that they will not be domed, so I didn't expect them to puff up. And when you look at the picture in the book, you can see the cupcake comes just over the edges of the liner. 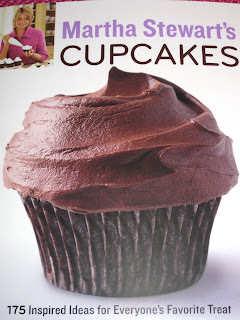 So here is this week's recipe (unchanged) from "Martha Stewart's Cupcakes". Enjoy!!! 1. Preheat oven to 350 degrees F. Line standard muffin tins with paper liners. Whisk together flour, baking soda, and salt. In another bowl, whisk sugar, molasses, and eggs until smooth; whisk in melted mutter and the hot water. Stir in flour mixture until just incorporated, then stir in the ginger. 2. Divide batter evenly among lined cups, filling each three-quarters full. Bake, rotating tins halfway through, until a cake tester inserted in centers comes out clean, about 20 minutes (cupcakes will not be domed). Transfer tins to wire racks to cool completely before removing cupcakes. Cupcakes can be stored overnight at room temperature, or frozen up to 2 months, in airtight containers. 3. 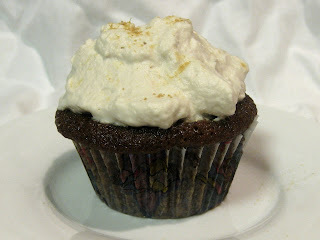 To finish, dollop whipped cream onto cupcakes, and dust lightly with ground ginger. Serve immediately. Whisk heavy cream until soft peaks form. If not using immediately, whipped cream can be refrigerated, covered tightly, up to 3 hours in an airtight container. *Rats! My Princess cupcake liners didn't show up after baking, I'm bummed. Soo.. Are there any of these left...? (grabbing car keys and putting shoes on) You know how I love those ginger cookies, I wanna try this! I'm going to assume you minced that ginger pretty fine, and if you did I'll share a secret. There is a company called The Ginger People and they sell minced ginger already done in a jar and it is just as good as fresh. (this is coming from someone who uses a LOT of ginger with high standards) It's a HUGE time saver and I know they carry it at Whole Foods. Second and speaking of Whole Foods.. Did you know they make brown sugar whipped cream in a can? I'm so glad you are going to be baking along with me! Your cupcakes look fantastic - I can't decide what to make next! Great Laura...NOW you tell me!! !